3D printing technology has been around for two decades, but the price has come down in recent years and more people have been able to make use of it. Consequently, we&apos;ve started to be able to really tap into its vast potential. 3D printed products are being spewed out left, right and center; from the building blocks of houses to replica shark skin. It almost seems as though the capabilities are endless, and the technology is not anticipated to slow down any time soon. One really exciting application of 3D printing is the generation of body parts. The level of detail that this technology can produce often supersedes that of traditional methods, offering patients a superior fit or design, and they can often be produced at an impressively low cost. Researchers have turned to 3D printing to produce a wide variety of body parts. Around two weeks ago we heard the story of a teenager who received a 3D printed bright pink robotic prosthetic arm to replace the arm that she lost in a boating accident many years ago. 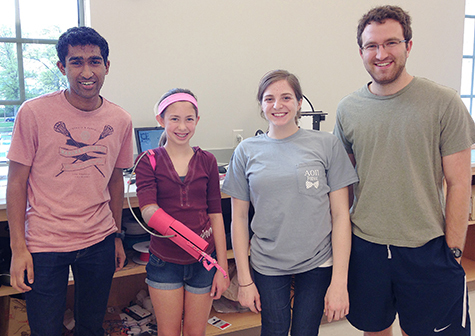 The arm, which was produced by a trio of biomedical engineering students at Washington University in St. Louis, only cost $200 in total; a fraction of the normal cost of prosthetics which are usually a minimum of $6,000. The recipient, Sydney Kendall, could use shoulder movements to manipulate the arm to perform tasks such as throwing a ball and moving a computer mouse. Image credit: Washington University in St Louis. The students that designed and produced the robotic arm with the recipient, Sydney Kendall. Earlier on this year a story emerged of a teenage boy from South Sudan, Daniel Omar, who lost his hands when a bomb exploded when he was 14. 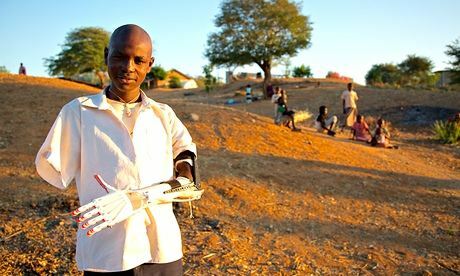 Two years on, he received a 3D printed prosthetic arm from an American startup called Not Impossible Labs which cost only $100 to produce. Once again movements by the user could trigger the fingers to move. Image credit: Not Impossible/ Project Daniel. Daniel Omar with the prosthetic arm. One of the most incredible reports yet is that of a young woman from the Netherlands who underwent an operation in March this year to replace almost all of her skull with a 3D printed implant. The procedure was carried out by a team of neurosurgeons at the University Medical Centre Utrecht. The woman suffered a chronic bone disorder and the thickness of her skull had increased from 1.5cm to 5cm, and consequently she had started to lose her vision. If her skull had not been replaced doctors predicted that serious brain damage may have ensued. To add to the growing list of 3D printed body part recipients is a British woman named Meryl Richards who was injured in a traffic accident almost 40 years ago. In a report just last week it was revealed that she received a 3D printed hip replacement at Southampton General Hospital after six hip operations had failed to fix the problem. A CT scan was used as the basis for the design of the joint, which was made from powdered titanium. Stem cells were also taken prior to surgery from her hip which were then cultured in order to produce a bigger batch. These cells were then put back in the patient in order to encourage new bone formation around the implant. This surgery was not cheap, however, and cost in total around $20,000; around 10 times more than usual replacement joints. Perhaps even more impressively, earlier this year a man was given a 3D printed pelvis to replace the half he lost due to a rare type of bone cancer called chondrosarcoma. The pelvis was also produced using powdered titanium, and he was given a standard hip replacement alongside the new pelvis. What other awesome body parts can be produced by 3D printers? A UK-based company called Fripp Design has been collaborating with various universities in the UK in order to produce 3D printed facial prosthetics and 3D printed eyes. The products that they can churn out are cheap and can be created in batches so can be replaced at low cost. The level of detail on the prosthetic eyes is also incredible as they come in a variety of sizes with precise color matches. Image credit: Fripp Design/ Manchester Metropolitan University. Princeton University scientists have also been experimenting with the capabilities of this technology and last year revealed their 3D printed “bionic ear” that is capable of detecting a range of radio frequencies far greater than humans. Rather than being designed to replace human ears this was more of a proof of principle experiment aimed at bridging electronics with materials. The team printed layers of a matrix composed of hydrogel and calf cells with silver nanoparticles that formed a coiled antenna. The bovine cells then later turned into cartilage. The team hope that they can develop the technology so that the ear can detect acoustic sounds, and suggest that maybe one day it could be used to restore or enhance human hearing. Image credit: Frank Wojciechowski, Princeton University. The "bionic ear". Cornell University researchers have also been working on 3D printed ears using a similar process of injecting cartilage cells encapsulated in a hydrogel into a collagen mold. The cells then go on to develop cartilage which replaces the mold over a few months. These ears are being designed with the goal of being used in reconstructive surgery, for example in children born with ear deformities or people who have lost their ears from accidents. So there you have it- some pretty incredible examples of what 3D printing has achieved so far. Imagine what the future will hold.